The Evernote Web Clipper allows you to save anything you see on the web quickly and easily straight into your Evernote account. You can clip a full page, single article or just the URL and save it to a designated Notebook and add tags. 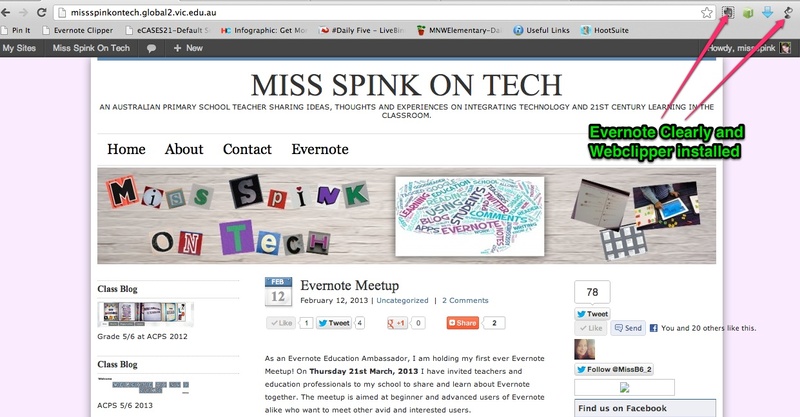 Your web clips then become searchable within your Evernote account. Doing this allows me to have all of my information at the tip of my fingers, right when I need it and across my multiple devices. 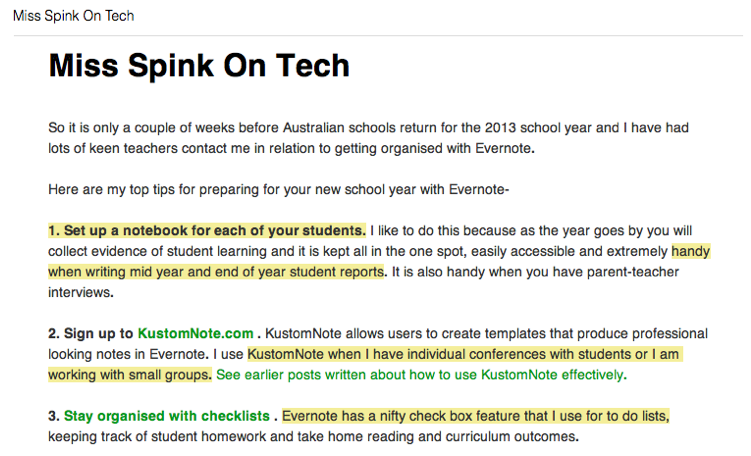 It gets better…Evernote Clearly might just be my favourite Evernote tool yet! Do you ever get frustrated at annoying adds that catch your eye when trying to read something? Or find it frustrating when the menu bars take up nearly half of the screen? Clearly makes blogs, webpages and articles clean, clear and easy to read. Now you can read these pages free from distraction and even change the theme and look of the page to suit you and your style. 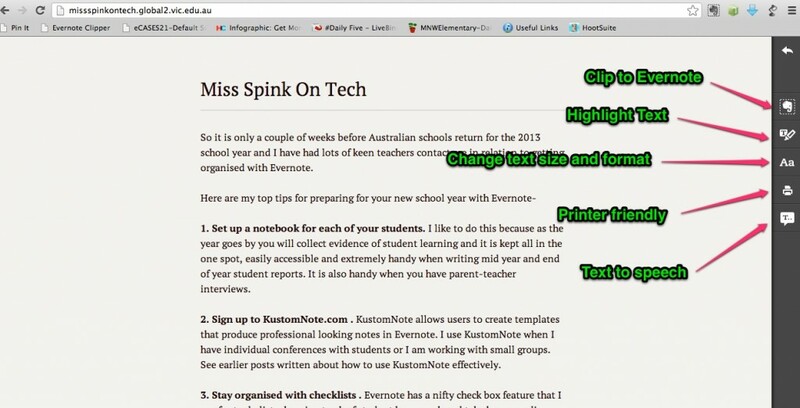 Once you have used Clearly, you can then capture the page to Evernote! Perfect! Clearly also allows you to highlight text, print a ‘clear’ version (but who prints these days anyway?) and maybe the best feature yet, especially after a long day at work…will even read the text to you with the text to speech feature! Using these tools, my research, web browsing and bookmarking has clearly become more productive! Make sure you have the Web Clipper and Clearly installed. Once installed they will appear in the top right hand corner of your web browser. I use the Web Clipper every day when I’m reading through blogs and finding great ideas (and the occasional recipe!) to store things in Evernote. It’s such a handy little tool to have. I haven’t tried Clearly though. Will have to, once I swap default browsers! And I liked your comment about the fad of social bookmarking – I actually still use it, but only to store blog/website recommendations for school appropriate iPad apps because it’s the one constant question I get and I can easily send them off to whoever’s asking. But beyond that, I’ve given up and just clip everything! If you love clipping recipes…have you tried Evernote food?? I love it…not sure if Evernote could bring out a product I didn’t like! haha. I can still see how you would use social bookmarking this way. You could also create a public link to your notebook that has your iPad apps and blogs clipped and share it that way…food for thought! What a great idea! Will be certainly using this to save everything to Evernote. I have previously used Diigo to save URLs etc but this seems like a lot smoother process. Thanks for the great tip 🙂 Loving your site and loving Evernote!